Well before Sir Arthur Conan Doyle penned his first Sherlock Holmes story, people have been fascinated with how science and reason could be applied to solving a crime. As technology and methods advanced our ability to detect and analyze evidence, jobs in forensic science became viable careers. 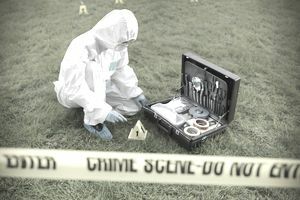 The advent of popular television shows like CSI has gotten people even more interested in such careers, so that now more than ever people are wanting to know how to become a forensic scientist. Forensic science has become a popular career field, which in turn means it's become a competitive one. That means you're going to have to be on your 'A' game to make yourself marketable and land the job you want. First things first realize that specific requirements with regards to issues like minimum age or citizenship will vary widely by employer and discipline. In the U.S., government employees, specifically those who work for local, state or federal law enforcement agencies, will typically need to be U.S. citizens, though not always. You need to understand that "forensic scientist" is a broad term. Forensics is a word applied to anything that has to do with the law, so in truth, any scientific discipline can be considered "forensic" once it's applied in criminal justice or the legal realm. With that said, there are not necessarily minimum requirements to become a forensic scientist, but rather general guidelines to follow to get qualified for this important job. Forensic scientists work in any number of scientific disciplines, from anthropology to toxicology and nearly everything in between. The first thing you need to have in order to become a forensic scientist is an education. At a minimum, you'll need to have a bachelor's degree. To be truly successful and advance, though, you'll eventually want to explore a master's degree or even a doctorate. To work as a forensic scientist, you need to have a strong scientific background. Generally, you will need to major in one of the natural sciences: physics, biology or chemistry. For other specialties, such as forensic anthropology, you will need to earn a degree in the relevant discipline. Find your interest and learn as much as you can about it. If you want to work in forensic science, you need to not only be well versed in your relevant scientific discipline but the study of crime and the criminal justice system, as well. This will mean you'll want to have coursework or even another bachelor's degree in criminal justice or criminology in addition to your scientific training. The competitive field of candidates means you'll need to make yourself an expert in your field before you even apply for a job. It's frustrating, but the best candidates are those who already have experience, so you need to get some. How do you do that? By building a resume that includes internships, volunteer work and an educational background that shows you're well qualified for the job you want. Familiarize yourself with the various fellowships and organizations that support forensic scientists, and stay up to date on trends in the field. Read forensic science journals and stay abreast of the issues that are impacting the field today. A strong knowledge of the scientific method is important, but it won't help you unless you can articulate your findings. To be successful, you need to have strong oral and written communication skills, and you can expect to be evaluated on these during the hiring process, either through interviews or candidate assessment processes. Forensic scientists deal with confidential and sensitive information. Even if they're working in a contractor or advisory status, they most often must be vetted to ensure their background won't be problematic for a successful prosecution or show they're susceptible to unethical behavior. The background check may not be as extensive as that of a law enforcement career, but you can bet that your employer will want to get a clear picture of who they're hiring. New forensic scientists often work as apprentices under experienced scientists. They may work as lab techs or research assistants, learning more about the job and how best to apply the knowledge they've gained in school. Landing a job as a forensic scientist is by no means an easy prospect. It takes hard work, dedication, planning and a high degree of intelligence. In order to prove you're the right person for these fascinating careers, you need to be at your best every step of the way. For those with an analytical mind, a desire to help others and a drive to succeed, a career in forensic science is a great opportunity to put your strengths to work for you. If you think you have what it takes, then you may find working as a forensic scientist is the perfect criminology career for you.